Background/Aim: The objective of the study is to clarify whether early oral refeeding (EORF) and quickly increasing diet (QID) are of benefit to patients with mild acute pancreatitis compared with a traditional oral refeeding strategy. Materials and Methods: Studies were searched in PubMed, Cochrane library, ScienceDirect, SpringerLink, China Biology Medicine disc and Embase. A meta-analysis was then performed, using relapse of abdominal pain, nausea/vomiting, and length of hospital stay (LOHS) as the evaluation indices. Results: Eight trials met the inclusion criteria. 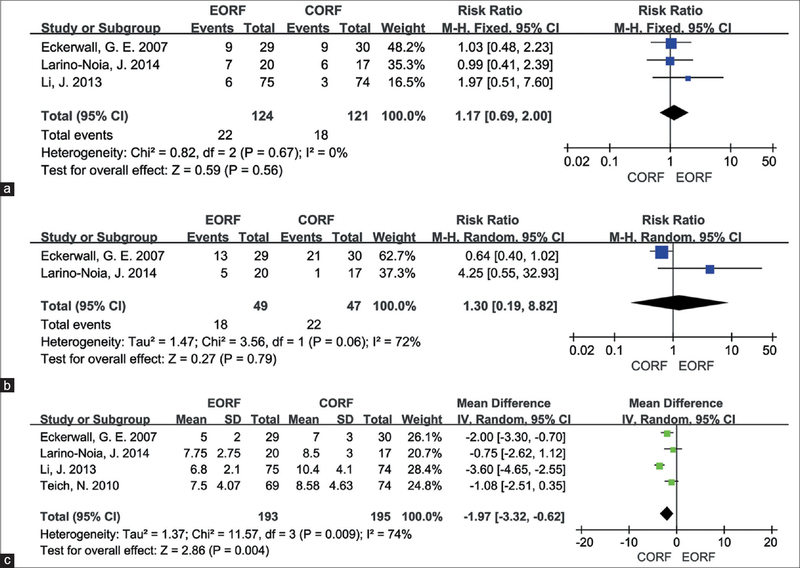 For the oral refeeding time group, EORF could significantly decrease the LOHS (mean deviation [MD] −1.97; 95% confidence interval (CI) −3.32 to −0.62;P = 0.004), and there was no significant difference for relapse of abdominal pain (relative risk [RR] 1.17; 95% CI 0.69–2.00;P = 0.56) or nausea/vomiting (RR 1.30; 95% CI 0.19–8.82;P = 0.79) when compared with conventional oral refeeding. For the oral refeeding material group, there was no significant difference for relapse of abdominal pain (RR 0.86; 95% CI 0.53–1.40;P = 0.54), nausea/vomiting (risk difference −0.01; 95% CI −0.19–0.18;P = 0.94), or LOHS (MD −0.88; 95% CI −2.24–0.48;P = 0.20) between the QID and stepwise increasing diet groups. Conclusion: Pure EORF or QID caused no damage to patients with mild acute pancreatitis, and EORF could significantly decrease the LOHS. After scanning the titles and abstracts, and removing duplications, 18 references remained for intensive reading and assessment using MINORS. Finally, eight trials remained to perform this meta-analysis [Figure 1]: four trials to analyze oral refeeding time ,,, [Table 1], and five trials to analyze oral refeeding material ,,,, [Table 2]. For abdominal pain, the χ2 and I2 were 0.82 (P = 0.67 > 0.1) and 0%, respectively, suggesting homogeneity among the studies. The fixed-effect model was used and the results showed no significant difference (RR 1.17; 95% CI 0.69–2.00; P = 0.56) [Figure 2]a. The included studies were heterogeneous for the comparison of nausea/vomiting (χ2 = 3.56, P = 0.06 < 0.1; I2 = 72%). Thus, the random-effect model was used and the results revealed no significant differences (RR 1.30; 95% CI 0.19–8.82; P = 0.79) [Figure 2]b. For LOHS, the results showed that the included studies were heterogeneous (χ2 = 11.57, P = 0.009 < 0.1; I2 = 7 4%) and the use of EORF could significantly decrease the LOHS (MD −1.97; 95% CI −3.32 to −0.62; P = 0.004) [Figure 2]c.
For abdominal pain, the χ2 and I2 were 1.47 (P = 0.69 > 0.1) and 0%, respectively, suggesting homogeneity among the studies. The fixed-effect model was used and the results showed no significant difference (RR 0.86; 95% CI 0.53–1.40; P = 0.54) [Figure 3]a. The included studies were heterogeneous for nausea/vomiting (χ2 = 3.07, P = 0.08 < 0.1; I2 = 67%). Thus, the random-effect model was used and the results revealed no significant difference (RD −0.01; 95% CI −0.19–0.18; P = 0.94) [Figure 3]b. For LOHS, the results showed that the included studies were heterogeneous (χ2 = 30.14, P ≤ 0.00001; I2 = 87%); however, there was no significant difference between QID and SID (MD −0.88; 95% CI −2.24–0.48; P = 0.20) [Figure 3]c.
Yadav D, Lowenfels AB. The epidemiology of pancreatitis and pancreatic cancer. Gastroenterology 2013;144:1252-61. Fagenholz PJ, Fernández-del Castillo C, Harris NS, Pelletier AJ, Camargo CA Jr. Direct medical costs of acute pancreatitis hospitalizations in the United States. Pancreas 2007;35:302-7. Hazra N, Gulliford M. Evaluating pancreatitis in primary care: A population-based cohort study. Br J Gen Pract 2014;64:e295-301. Meier R, Beglinger C, Layer P, Gullo L, Keim V, Laugier R, et al. ESPEN guidelines on nutrition in acute pancreatitis. European society of parenteral and enteral nutrition. Clin Nutr 2002;21:173-83. Teich N, Aghdassi A, Fischer J, Walz B, Caca K, Wallochny T, et al. Optimal timing of oral refeeding in mild acute pancreatitis: Results of an open randomized multicenter trial. Pancreas 2010;39:1088-92. Lariño-Noia J, Lindkvist B, Iglesias-García J, Seijo-Ríos S, Iglesias-Canle J, Domínguez-Muñoz JE, et al. 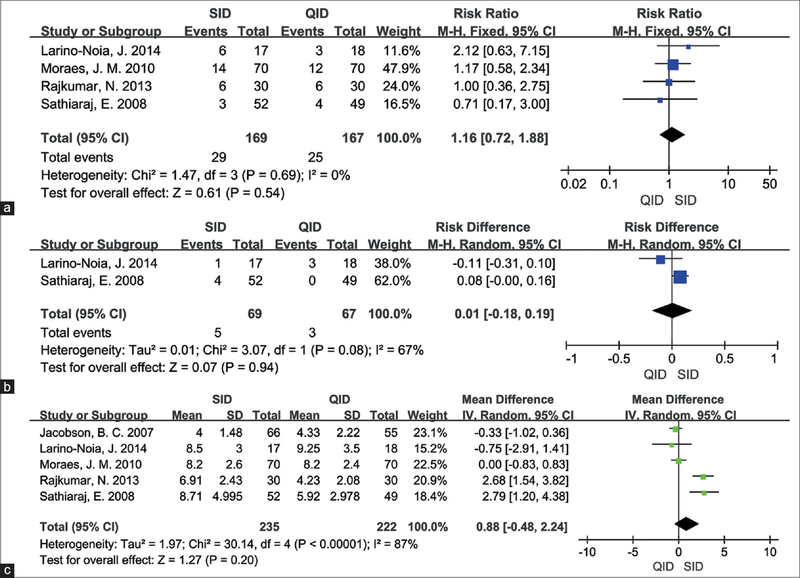 Early and/or immediately full caloric diet versus standard refeeding in mild acute pancreatitis: A randomized open-label trial. Pancreatology 2014;14:167-73. Li J, Xue GJ, Liu YL, Javed MA, Zhao XL, Wan MH, et al. Early oral refeeding wisdom in patients with mild acute pancreatitis. Pancreas 2013;42:88-91. Eckerwall GE, Tingstedt BB, Bergenzaun PE, Andersson RG. Immediate oral feeding in patients with mild acute pancreatitis is safe and may accelerate recovery – A randomized clinical study. Clin Nutr 2007;26:758-63. Pupelis G, Snippe K, Plaudis H, Rudakovska M. Early oral feeding in acute pancreatitis: An alternative approach to tube feeding. Preliminary report. Acta Chir Belg 2006;106:181-6. Zhao XL, Zhu SF, Xue GJ, Li J, Liu YL, Wan MH, et al. 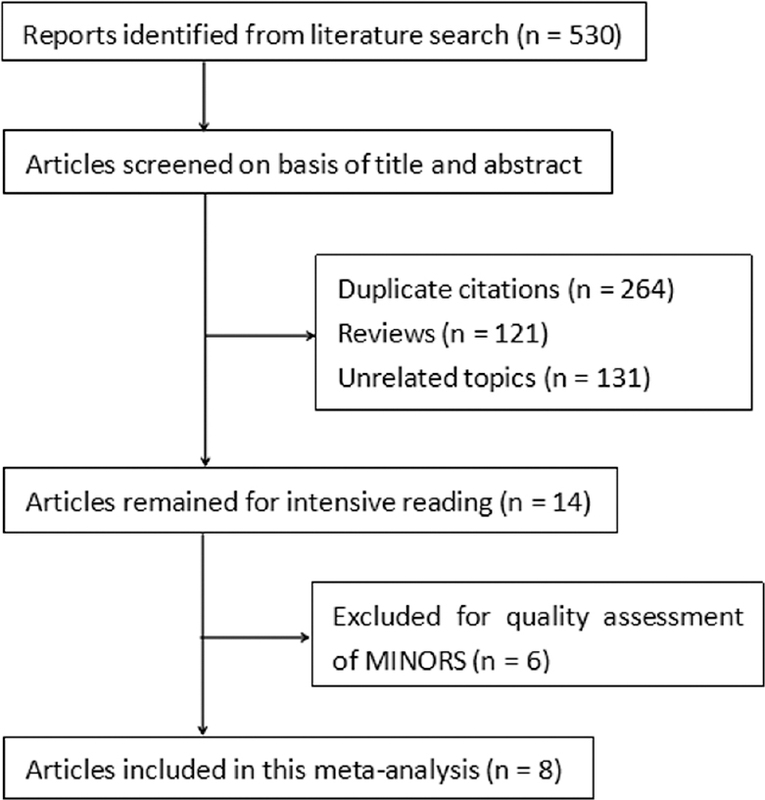 Early oral refeeding based on hunger in moderate and severe acute pancreatitis: A prospective controlled, randomized clinical trial. Nutrition 2015;31:171-5. Rajkumar N, Karthikeyan VS, Ali SM, Sistla SC, Kate V. Clear liquid diet vs. soft diet as the initial meal in patients with mild acute pancreatitis: A randomized interventional trial. Nutr Clin Pract 2013;28:365-70. Moraes JM, Felga GE, Chebli LA, Franco MB, Gomes CA, Gaburri PD, et al. A full solid diet as the initial meal in mild acute pancreatitis is safe and result in a shorter length of hospitalization: Results from a prospective, randomized, controlled, double-blind clinical trial. J Clin Gastroenterol 2010;44:517-22. Sathiaraj E, Murthy S, Mansard MJ, Rao GV, Mahukar S, Reddy DN, et al. Clinical trial: Oral feeding with a soft diet compared with clear liquid diet as initial meal in mild acute pancreatitis. Aliment Pharmacol Ther 2008;28:777-81. Jacobson BC, Vander Vliet MB, Hughes MD, Maurer R, McManus K, Banks PA, et al. A prospective, randomized trial of clear liquids versus low-fat solid diet as the initial meal in mild acute pancreatitis. Clin Gastroenterol Hepatol 2007;5:946-51. Janisch NH, Gardner TB. Advances in management of acute pancreatitis. Gastroenterol Clin North Am 2016;45:1-8. Kahl S, Schütte K, Glasbrenner B, Mayerle J, Simon P, Henniges F, et al. The effect of oral pancreatic enzyme supplementation on the course and outcome of acute pancreatitis: A randomized, double-blind parallel-group study. JOP 2014;15:165-74. Singh N, Mishra SK, Sachdev V, Sharma H, Upadhyay AD, Arora I, et al. Effect of oral glutamine supplementation on gut permeability and endotoxemia in patients with severe acute pancreatitis: A randomized controlled trial. Pancreas 2014;43:867-73.